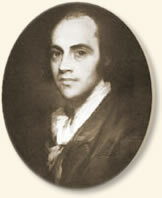 The relationship between Alexander Hamilton and Aaron Burr was charged with political rivalry and personal animosity. 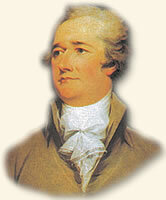 Alexander Hamilton, the nation's first Secretary of the Treasury, was the chief author of The Federalist papers advocating a strong central government. Burr represented the old Republican Party. His greatest accomplishment was achieved in 1800 when he was elected Vice President to Thomas Jefferson. Hamilton considered Burr an unprincipled rogue. The antagonism between the two came to a head in 1804 when Hamilton thwarted Burr's attempt to gain re-nomination for Vice President as well as his bid to win the governorship of New York. Burr responded by challenging his antagonist to a duel, an invitation Hamilton felt compelled to accept. The parties being placed at their stations, the second who gives the word shall ask them whether they are ready; being answered in the affirmative, he shall say- present! After this the parties shall present and fire when they please. If one fires before the other, the opposite second shall say one, two, three, fire, and he shall then fire or lose his fire. He then asked if they were prepared; being answered in the affirmative, he gave the word present, as had been agreed on, and both parties presented and fired in succession. The intervening time is not expressed, as the seconds do not precisely agree on that point. The fire of Colonel Burr took effect, and General Hamilton almost instantly fell. Colonel Burr advanced toward General Hamilton with a manner and gesture that appeared to General Hamilton's friend to be expressive of regret; but, without speaking, turned about and withdrew, being urged from the field by his friend, as has been subsequently stated, with a view to prevent his being recognized by the surgeon and bargemen who were then approaching. No further communication took place between the principals, and the barge that carried Colonel Burr immediately returned to the city. We conceive it proper to add, that the conduct of the parties in this interview was perfectly proper, as suited the occasion." ground, supported in the arms of Mr. Pendleton. His countenance of death I shall never forget. He had at that instant just strength to say, 'This is a mortal wound, doctor;' when he sunk away, and became to all appearance lifeless. I immediately stripped up his clothes, and soon, alas I ascertained that the direction of the ball must have been through some vital part. His pulses were not to be felt, his respiration was entirely suspended, and, upon laying my hand on his heart and perceiving no motion there, I considered him as irrecoverably gone. I, however, observed to Mr. Pendleton, that the only chance for his reviving was immediately to get him upon the water. We therefore lifted him up, and carried him out of the wood to the margin of the bank, where the bargemen aided us in conveying him into the boat, which immediately put off. During all this time I could not discover the least symptom of returning life. I now rubbed his face, lips, and temples with spirits of hartshorn, applied it to his neck and breast, and to the wrists and palms of his hands, and endeavoured to pour some into his mouth. hardly opened, wandered, without fixing upon any object; to our great joy, he at length spoke. 'My vision is indistinct,' were his first words. His pulse became more perceptible, his respiration more regular, his sight returned. I then examined the wound to know if there was any dangerous discharge of blood; upon slightly pressing his side it gave him pain, on which I desisted. Soon after recovering his sight, he happened to cast his eye upon the case of pistols, and observing the one that he had had in his hand lying on the outside, he said, "Take care of that pistol; it is undischarged, and still cocked; it may go off and do harm. Pendleton knows " (attempting to turn his head towards him) 'that I did not intend to fire at him.' 'Yes,' said Mr. Pendleton, understanding his wish, 'I have already made Dr. Hosack acquainted with your determination as to that' He then closed his eyes and remained calm, without any disposition to speak; nor did he say much afterward, except in reply to my questions. He asked me once or twice how I found his pulse; and he informed me that his lower extremities had lost all feeling, manifesting to me that he entertained no hopes that he should long survive." Carried to his Manhattan home, Hamilton lingered in agony - the pistol's ball lodged next to his spine. He died the following day. Coleman, William (ed), A Collection of Facts and Documents, relating to the Death of ... Alexander Hamilton (1804); Mitchell, Broadus, Alexander Hamilton, The National Adventure 1788-1804 (1962). "Duel At Dawn, 1804," EyeWitness to History, www.eyewitnesstohistory.com (2000). The location of the duel lies in Weehawken, N.J. almost directly opposite 42nd St.
Hamilton's eldest son had been killed in a duel on the same spot three years earlier. 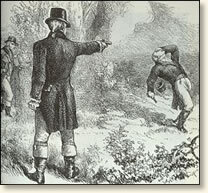 Burr's life began a steep decline after the duel. Indicted for murder by both New Jersey and New York, he was never brought to trial. He wandered the country entering into various schemes. These included an obscure land deal in the Louisiana Purchase for which he was tried for treason in 1807. He was acquitted. He died in 1836 a broken man.